Have you ever heard the notion that romance begins in the kitchen, and not in the bedroom? Well, science is finally supporting that statement. 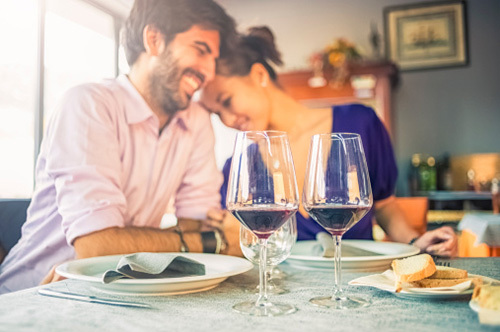 In a new study published in the journal Appetite, Drexel University researchers found that a young woman’s brain responds better to romance on a full stomach, rather than an empty stomach. For the study, researchers observed the brain circuitry of former women dieters versus non-dieters in both satiated and hungry states. Women with and without a dieting history had larger brain activation when responding to romantic pictures in reward-related neural regions after eating a meal compared to when hungry. Testing was done with magnetic resonance imaging (MRI). This finding is based on a small pilot trial from the Drexel team published in the journal Obesity in 2014. That work examined how the brain changes from food cues. Researchers observed whether the brain’s reward response would change significantly in non-dieters compared to dieters. Participants were young college women of average weight. Researchers found that the brains of dieters responded considerably better to food cues in the reward regions of the brain after eating when compared to non-dieters or current dieters. The highly palatable food cues included chocolate cake, while neutral cues included carrots. That study suggested that women with a history of dieting may be predisposed to desire food over non-dieters. Ely, A.V., et al., “The way to her heart? Response to romantic cues is dependent on hunger state and dieting history: An fMRI pilot study,” Appetite 2015; http://www.ncbi.nlm.nih.gov/pubmed/26145276, 95: 126, doi: 10.1016/j.appet.2015.06.022. “Stomach is the way to a woman’s heart, too,” ScienceDaily web site, August 13, 2015; http://www.sciencedaily.com/releases/2015/08/150813162335.htm.